Detective Madison Knight has risked her badge—and her life—in the pursuit of justice before, and she just might need to do so again. Two victims are found murdered and naked in the home of Steven Malone, who is the largest contributor to the Stiles PD. One victim is his wife. The other victim is a John Doe. This high-profile double homicide immediately pits Madison against her sergeant, who seems more intent on protecting the Malones’ reputation and retaining a benefactor than catching a killer. Madison will need to pull on her tenacity and courage if she’s going to follow the evidence without prejudice. In the process, it becomes clear that finding justice isn’t always black and white, and often the shades in between tell the fullest story—and it’s not something she will forget anytime soon. 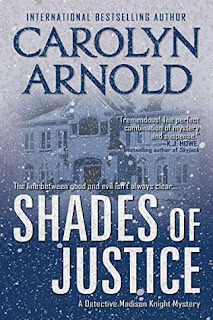 Shades of Justice is a murder mystery with twists and turns that will have readers flipping the pages until the wee hours of the morning. The ninth installment in an international bestselling series, it doesn’t matter if this is the first book you’re reading in the Detective Madison Knight series or not; all the books stand alone! Buy this book now and join the investigation! Uncover clues, follow leads, and catch a killer like hundreds of thousands of readers in this series have done before you. Perfect for fans of James Patterson, Michael Connelly, and JD Robb.